What happens when you order a sloth by express mail? Find out in this charming, quirky book about one girl’s quest for the perfect pet. Jenny Offill is the author of 17 Things I’m Not Allowed to Do Anymore, a Parenting Magazine Best Book of the Year and a Bank Street College of Education Best Children’s Book of the Year, and 11 Experiments That Failed, also a Bank Street College of Education Best Children’s Book of the Year, which Kirkus Reviews, in a starred review, called “the most joyful and clever whimsy.” Learn more at jennyoffill.com. 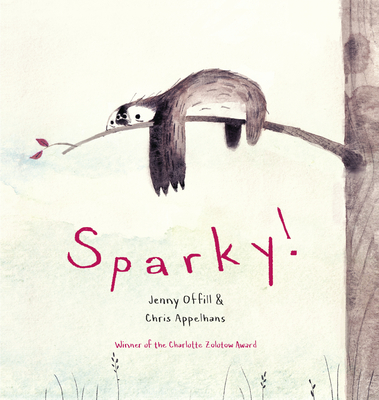 Chris Appelhans was selected as the Children’s Choice Illustrator of the Year at the Children’s Choice Book Awards for Sparky!, his first picture book. The book received two starred reviews, including one from Booklist declaring, “Appelhans is a revelation.” Chris has also worked on several films, as an illustrator and a production designer for Coraline, an environment designer for Fantastic Mr. Fox, and a visual development artist for The Princess and the Frog.